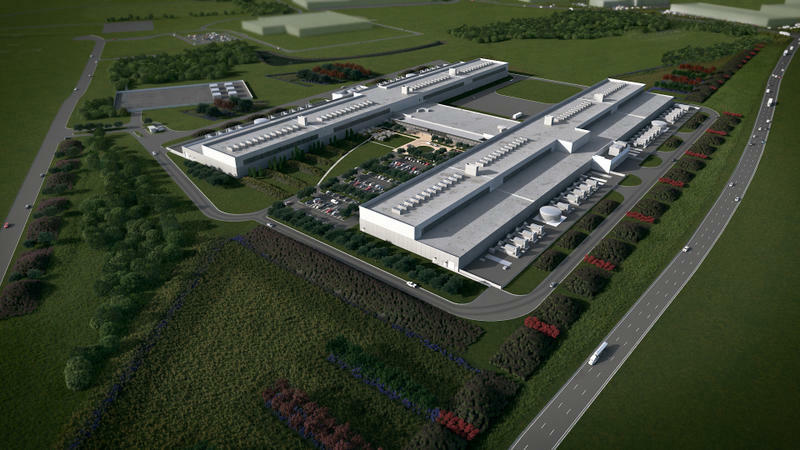 A rendering of the planned Facebook data center in New Albany. Social networking giant Facebook did as was reported this week, announcing announced it will build a new, 970,000-square-foot data center in Central Ohio. And the company is doing it with the help of local and state tax incentives. But the terms of those agreements weren’t easy to come by. Rachel Peterson, Director of Data Center Strategy and Development at Facebook, says this is the 10th of its kind for Facebook. “It’s going to be delivering hundreds of millions of dollars of investment to the local community and the state as well as thousands of construction jobs and hundreds of full time operational jobs,” Peterson says. The proposed data center in New Albany, near the line that divides Franklin and Licking Counties, will be powered by 100 percent renewable energy. An official statement put out by the public relations firm working with Facebook on the project says there will be 100 permanent jobs created by the project. Peterson says those will be high tech jobs, and explains the employees will operate the data servicing at the center. But Facebook wouldn’t disclose what the pay would look like. People who work in construction trades are hoping they will benefit from the project. That includes Jeff Rush, a business representative for Sheet Metal Workers, Local 24, who says it’s a big deal. Also involved: A lot of state and federal tax credits. But the event did not include many details. 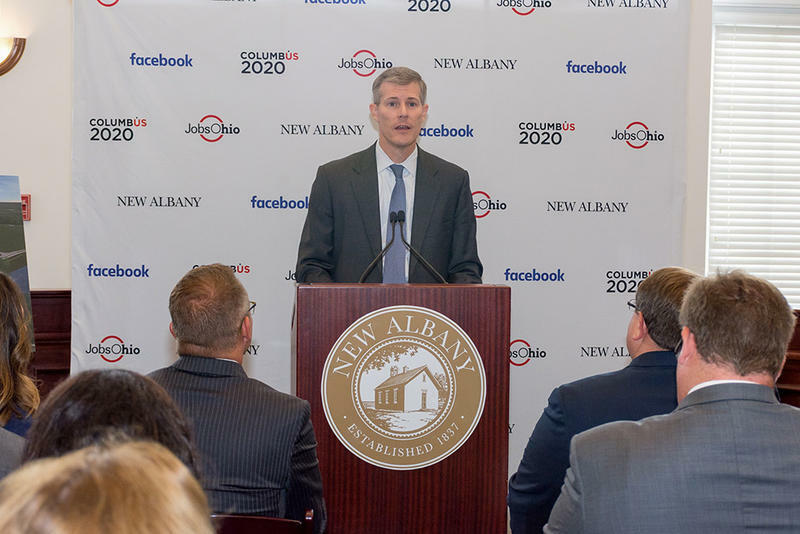 New Albany mayor Sloan Spalding says the Facebook deal with his city requires a minimum investment. “They have a payroll threshold that they have to meet under our agreement and most of the companies, the data centers we have, have no trouble meeting that threshold,” Spalding says. And John Minor, the leader of JobsOhio, the state’s private, non-profit, job creation company, was involved in negotiating the deal. Minor says Facebook’s investment is significant. Some key details of the agreements are known and some are still being worked out. Ohio’s Tax Credit Authority approved a job creation incentive for 2 percent of the new Ohio employee payroll from this year to 2026, provided that Facebook creates 50 new jobs and $4 million in new annual payroll. Facebook estimates the value of that to be more than $834,000. And the state has granted a 100 percent sales tax exemption for the facility for as many as 40 years. The total price tag for that part of the package is more than $37 million. Gov. John Kasich says it’s worth the investment and could help attract similar investments in the future. Still, some who have studied these types of deals, but not this particular one, have questions about all of the incentives being offered. Patton says more transparency is needed for deals like this one, but she knows that’s not likely to happen anytime soon. Now that the money is there for the Facebook project, the building begins. The project is expected to be complete in 2019. With a planned opening of 2019, Facebook's 10th data center will be built in New Albany with $750 million and a mixture of local and state funding incentives. State officials hope it will only be the beginning. Facebook plans to invest $750 million in a new data center in central Ohio, marking another boost for the state's growing technology sector. 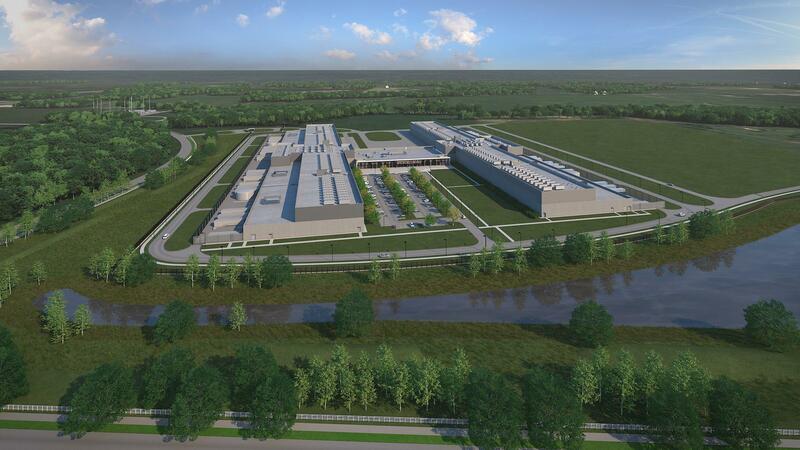 Multiple sources tell Ohio Public Radio that Facebook is expected to announce next week that it plans to bring a $750 million data center to New Albany.